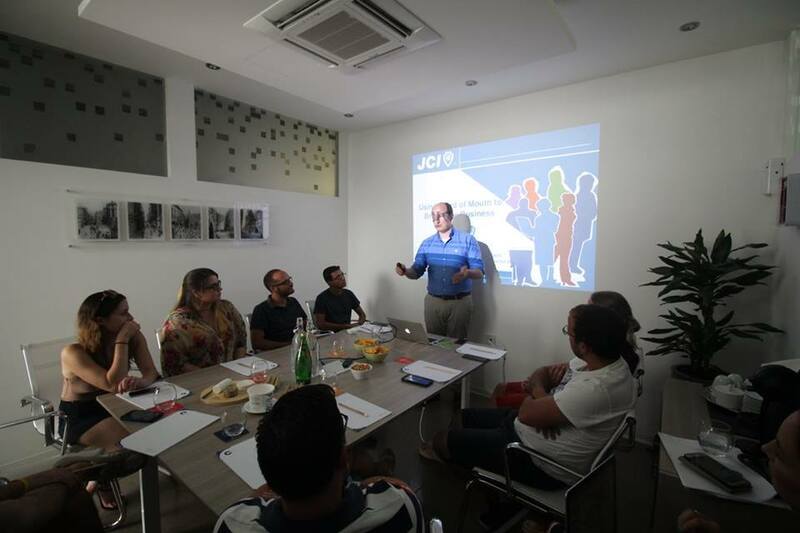 The Concept Stadium, marketing partners of Junior Chamber International (Malta), have welcomed into their offices debate champions Keira Keogh and Adrian Corcoran from JCI Ireland, to conduct a training session to the company’s team members. The session, which focused primarily on self-development, touched upon the ever important issues relating to workflow efficiency and business acumen – values that the company holds close to heart as it positions itself as a team of commercial creatives. Adrian Corcoran, an expert in debating skills, gave a talk on how word of mouth is still a key communication tool to generate leads, even in 2017. Companies must therefore recognise the need to train their staff members on how to present themselves in the social world, in order to generate business leads. Keira Keogh, a behaviour consultant, focused on time management and how little tasks help bring the puzzle together in work projects. The long-established principles of priortising tasks and planning ahead resonated with all team members, as a little goes a long way in our field. Directors Jonathan Dalli and Jonathan Chetcuti thanked JCI Malta for the opportunity to host the debate champions and said that self-development is a pursuit everyone should never stop working towards. “At the Concept Stadium, we believe in growing together and continuously improving ourselves, as a team and individual team players. Such training sessions reinforce our efforts to transform our Stadium into a think-tank that is alive with ideas and a place where we’re constantly being pushed outside our comfort zone. This is why we call ourselves commercial creatives, as we’re not only thriving for excellence in the creative field, but also in terms of our business acumen”, they said.